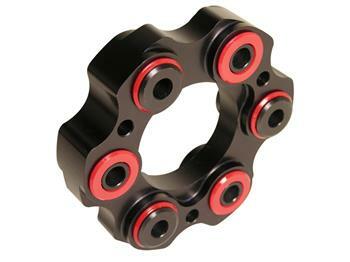 Is your factory rubber driveshaft coupler weak or damaged? Do you want to step-up to a precisely fabricated, supremely engineered, performance-herculean to keep you rolling? Prothane has solved the issues of weak OEM couplers with their Six Shooter driveline couplers! These couplers will gladly respond to the demands of your vehicle and provide the necessary rigidity you need to fully transfer its power to the wheels. They are machined from billet 6061 T6 aluminum and feature specially formulated urethane inserts that provide excellent NVH dampening. Look to Prothane Six Shooter driveline couplers to keep you in the driver’s seat.